Be the first to share your favorite memory, photo or story of Enriqueta. This memorial page is dedicated for family, friends and future generations to celebrate the life of their loved one. 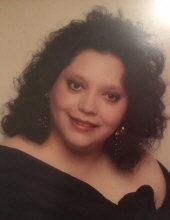 Enriqueta Villarreal, a resident of Austin, passed away peacefully on Thursday evening, November 29, 2018 at Seton Medical Center in Austin at the age of 62 surrounded by her loving family. Enriqueta was born on December 30, 1955 in New Braunfels to the late Reyes Villarreal, Sr. and Amelia Martinez Villarreal. She was one of the Choir Directors at Our Lady of Perpetual Help Church and enjoyed singing and writing music. Arts and crafts were a loved hobby for her as well as knitting and sewing. She loved the holidays and especially loved to collect Nativity scenes and have them displayed during Christmas. Her love for Christmas will never be forgotten. She was preceded in death by her parents Reyes and Amelia Villarreal Sr. Survivors include her husband, Henry Allen; daughters, Laura Ashley Allen and Lisa Leslie Allen; brothers, Robert and wife Mary Jane, Raymon and wife Virginia, Richard and wife Gloria and Reyes, Jr. and wife Rosie; sister, Sally Ward; nephews, Richard, Jr., Reyes, III and Philip; nieces, Teresa, Celeste, Amber, Nina, Monica, Darlene, Lisa, Ashley, Amber and extended family and friends. Visitation will be held from 5:00 PM to 9:00 PM with the recitation of the Holy Rosary at 7:00 PM on Tuesday, December 4, 2018 at the Lux Funeral Home Chapel. The Mass of Christian Burial will be celebrated at 10:00 AM on Wednesday morning, December 5, 2018 at Our Lady of Perpetual Help Catholic Church. All services will end at the conclusion of the Mass on Wednesday morning. To send flowers or a remembrance gift to the family of Enriqueta Villarreal, please visit our Tribute Store. The recitation of the Holy Rosary will begin at 7:00 PM on Tuesday evening, December 4, 2018 at the funeral home chapel. Mass of Christian Burial. All services will end at the conclusion of the Funeral Mass on Wednesday morning. "Email Address" would like to share the life celebration of Enriqueta Villarreal. Click on the "link" to go to share a favorite memory or leave a condolence message for the family.